The Curator Gallery is pleased to present MacDowell Now: Recent Abstract Painting. Curated by MacDowell alum Mark Wethli, MacDowell Now brings together six artists who share two things in common: each was a Fellow at The MacDowell Colony in Peterborough, New Hampshire in 2017, and each creates abstract work that is notable for its strong color, fractured geometry, and intricate compositions, amplified by highly evolved, signature motifs. At the same time, it is the differences between these artists’ work that set up a revealing dialog and throw the unique qualities of each into higher relief. Taken together, the commonalities and contrasts represented by this particular cross-section of artists, who were among the wide array of 48 visual artists working in various mediums in residence at MacDowell in 2017, are also indicative of the vibrancy, relevance, and tremendous value of the MacDowell Colony’s ongoing commitment and importance to the arts. Lisa Corinne Davis’ paintings employ a dazzling topography of color and pattern to chart new territories that verge between the geographic and the neurological, the familiar and the unknown, and the intellectual and the emotional. Like the paintings themselves, Davis’ use of paradoxical titles, such as Analytical Anarchism, are intended to reflect this unsettling condition and to invite the viewer into a more supple and intuitive relationship with the world around them. This social ambition is further manifested in the paintings’ spectacular, sublime, and vertiginous spaces, in which order and disorder are constantly in play. Julian Kreimer’s densely patterned abstract drawings are just one facet of his work, which includes observational paintings as well. Like Davis’ work, they remind us of the world we know but in a schematic language all their own. While Kreimer’s observational paintings are immediate and direct (often completed in one sitting), his abstract colored pencil drawings are more complex ruminations on the building blocks of his art—color, space, and pattern—as well as the spatial tensions between form and space as well as surface and depth, that are common to all his work but central to the particular dynamism and allure of his abstract compositions. Through their intricate design, vernacular color, ornate hand-lettering, and idiosyncratic technique, John O’Connor’s works on paper share the obsessive characteristics and inherent playfulness of outsider art, but tempered by a sophisticated sensibility. As concrete texts, they don’t operate as abstractions per se but as earnest, apocryphal missives whose meaning, through the process of embellishment, seems to be intentionally veiled. In the process of decoding their verbal, numerical and/or symbolic meanings, viewers become equally engaged in the rewards of their restless energy and pure visual invention. Gina Occhiogrosso’s magisterial yet effervescent paintings are centered on the disruptive effect of fragmentation and reassembly inherent to collage, but reminiscent, in her work, of everything from domestic culture (quilting or patching, underscored by her occasional use of sewing and weaving) to public life, as in the dissonant and fleeting experience of an urban street. In their contrast of high color and faded color, like palimpsests in which the past and the present are equally apparent, there is the added dimension of time, lending them an unexpectedly elegiac quality within their lively, shifting, and highly engaging patchwork of forms. The syncopated design, upbeat energy, and vibrant color in Gary Petersen’s acrobatic compositions belie the work of a subtle colorist and a sophisticated pictorial architect. Although we feel the potential energy of their precarious balance of forms, there is no doubt about their ultimate stability, caught in a moment of stasis as timeless and nuanced as a Morandi painting, but arrived at through an extraordinary number of calibrations, tensions, and counterpoints in drawing, design, and color. For all their sophistication and complexity, however, there is also a hint of Buster Keaton; paintings whose poise and self-assurance are not immune to the immanent pratfall, the near-miss, and the graceful recovery. Amanda Wojick’s iconic yet animated paintings incorporate both collage and sculpture in their subtle reshaping of the rectangle. Whether the idiosyncratic shapes of the paintings are being driven by their surface design or visa versa is an open question, generating a reciprocating energy and an intriguing conversation between the two. The disposition of shapes and forms within each painting likewise reflects unseen or implied forces. Like the murmurations of birds or figures adjusting and readjusting their personal space in a bustling crowd, Wojick’s compositions transcend merely aesthetic decisions to achieve authentic parallels to lived experience. Mark Wethli is a painter, public artist, curator, and the A. LeRoy Greason Professor of Art at Bowdoin College, Brunswick, Maine. MacDowell Now: Recent Abstract Painting is the fourth show he has curated for The Curator Gallery, and his work has been shown in the gallery several times. Wethli’s work has been widely exhibited, including solo exhibitions in New York, Los Angeles, the Portland Museum of Art, and the DeCordova Museum of Art. He has held two residencies at the MacDowell Colony. Wethli’s work is included in numerous museum and private collections, including the Metropolitan Museum of Art and the Portland Museum of Art. 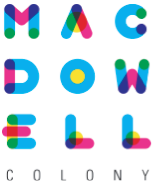 Composer Edward MacDowell and pianist Marian MacDowell, his wife, founded The MacDowell Colony in 1907 to nurture the arts by offering creative individuals of the highest talent an inspiring environment in which to produce enduring works of the imagination. Each year, MacDowell welcomes more than 300 architects, composers, filmmakers, interdisciplinary artists, theatre artists, visual artists, and writers from across the United States and around the globe, about 50 of whom work in the visual arts. More than 14,500 residencies have been awarded in 111 years. Recipients have included Ayad Akhtar, James Baldwin, Ta-Nehisi Coates, Ellen Driscoll, Louise Erdrich, Osvaldo Golijov, Cathy Park Hong, Dee Rees, Colson Whitehead, and Julia Wolfe. Pulitzer Prize-winning author Michael Chabon is the chairman of MacDowell’s board of directors.